Palumbo Group has released interior images and more details of Clorinda, its first ISA superyacht since the acquisition of the Ancona yard was finalised in August 2016. 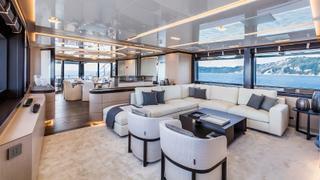 This 36.45 metre yacht is part of the yard's Sport 120 range, which already includes Soiree, Sealyon and Canpark. 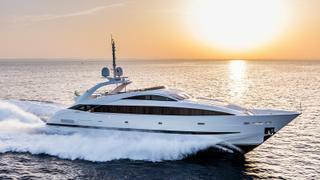 The new addition was delivered earlier this month and will be introduced to the public in September at the Cannes Yachting Festival and Monaco Yacht Show. The interior images below reveal her Francesco Guida-designed décor with an open-plan saloon that sports an unconventional layout, as the saloon is situated amidships and the dining area is back aft. Clorinda's exterior styling is based on the original ISA Sport 120 design by Andrea Valicelli, however the yard adds that there have been subtle tweaks that make her "a sort of crossover between previous models and the new ones designed by Team For Design Enrico Gobbi". Giuseppe Palumbo, CEO of the Palumbo Group, added: "Clorinda has a huge symbolic value for ISA Yachts — a sign of a true rebirth and transition towards a brand new course." A fast-planing GRP yacht, Clorinda features a raised pilothouse and a dramatic swooping superstructure. Accommodation for up to 10 guests is split across five staterooms, including a split-level owner's cabin, while the crew quarters allows for a staff of up to five people. 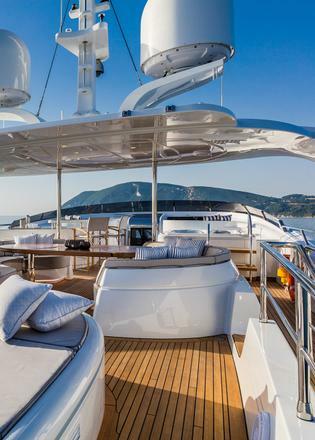 One of the key areas on board is the stylish superyacht sundeck, which features a circular spa pool, 12-person outdoor dining area, two built-in sofas, as well as a wet bar, complete with dumbwaiter and ice maker. Power comes from three MTU 16V 2000 M96 diesel engines twinned to Kamewa water jets, which allow for a top speed of 34 knots. When trimmed back to her cruising speed of 27 knots, Clorinda is capable of extended coastal cruises, thanks to a total fuel capacity of 22,000 litres, while the ABT Trac electric stabiliser system will ensure a smooth cruising experience for all those on board. Other projects currently under development at the Italian yard include the Columbus Oceanic 70, the Columbus Classic 80, and the ISA SuperSport 121.